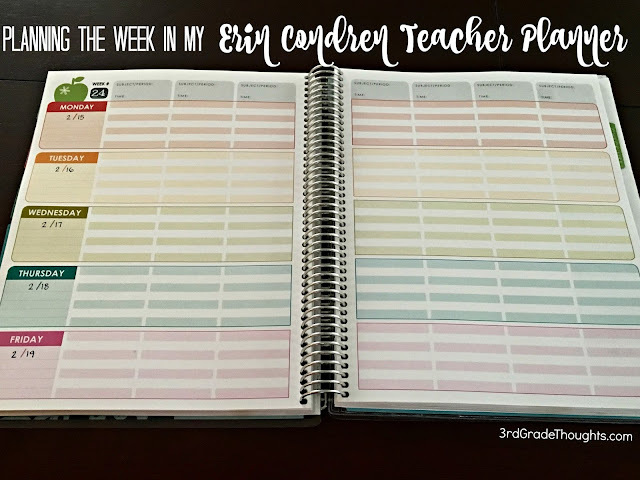 Many of you know how much I love my Erin Condren Teacher Planner. You can check out many past posts and freebies HERE. 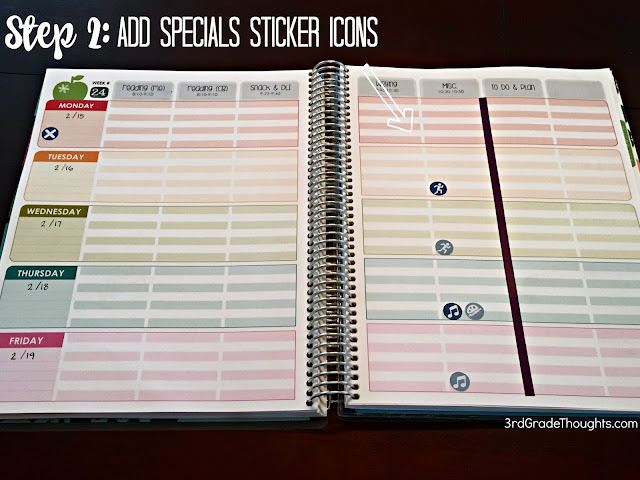 I have been posting a few layouts on Instagram and I wanted to take a few pictures this weekend to walk you through how I use the planner as well as the icon stickers found in my Etsy Store. 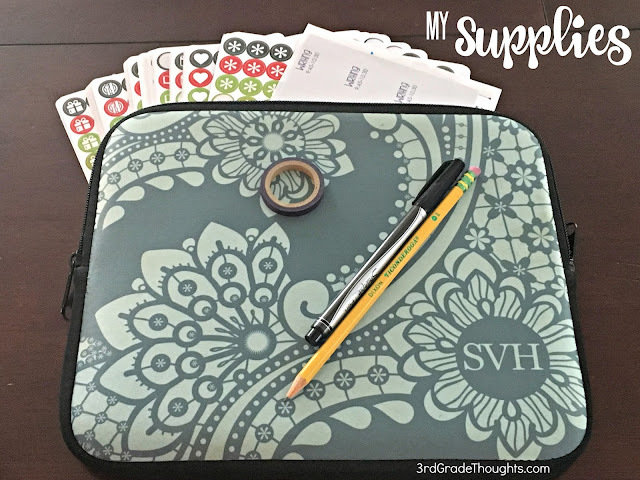 I have this great Carry-All Clutch from Erin Condren that I use to store all of my planning materials. I use the smaller size to hold all of my sheets of stickers, washi tape, Sharpie pen, and subject holders. 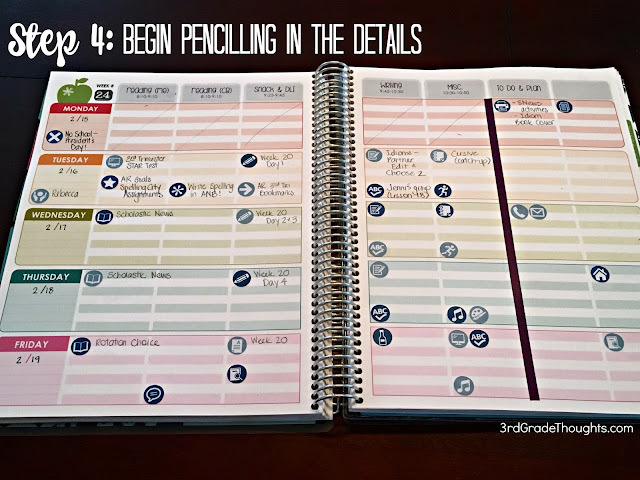 I'm a huge Ticonderoga pencil fan, too, but leave those outside of the clutch so pencil marks don't get everywhere. I will typiclly set up a few weeks at a time with these subject labels and washi tape. 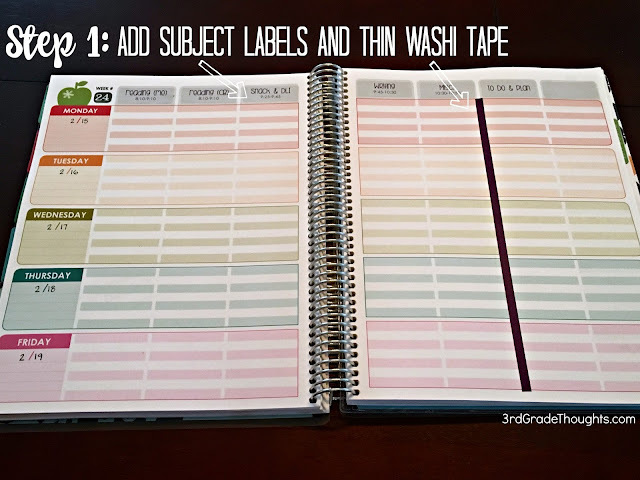 I purchased this thin purple washi tape at Michaels (it was a part of a set of thin tapes) and use Avery 8195 labels for the top. I also have some freebie subject templates HERE, if you're interested! Our specials schedule doesn't change each week and I got so tired of rewriting Art, Music, and PE over and over, that was the original inspiration for my planner stickers. I use these stickers to take up less space and remind me where we're heading each day. The colors don't mean anything specific, I just choose two that make me happy that week. I wish I could say there's a method to this madness, but there isn't. So much is repeated each week, so I have the same stickers marking their place, with the exceptions and notes that come up. 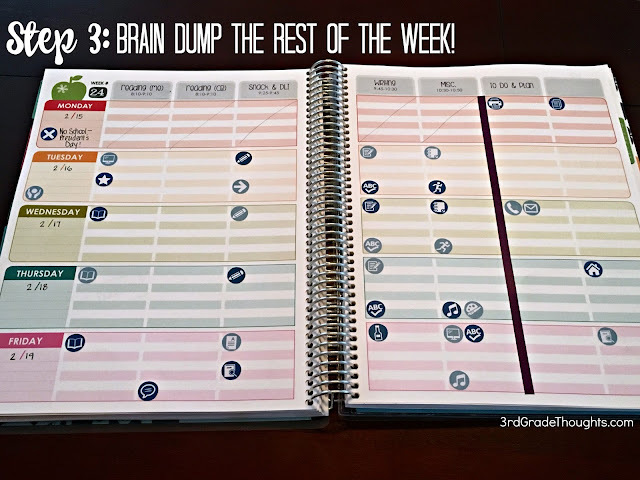 I job-share and teach literacy only, so that's why I have so much "To Do & Plan" space. I will use that space to mark out things to Print and Copy, people to Call and Email, things to remember to send home in the Newsletter (house icon), and who I need to email for Mystery Reader for the next week. These lists accumulate through the week and I will cross/check them off when they're done, so they usually aren't day-specific. This was a tricky one to blog about since I have to respect student privacy, but I started to pencil in some of the details of my week. Obviously, this is not a super-detailed planning system that I have, but this works beautifully as a big-picture view of the week. Especially with job-sharing, time goes fast and I want to make sure I am accomplishing as much as possible while I am at school, so my half-time doesn't become a full-time+ job.... that's a work in progress, of course! I find that leaving this open at my desk with the icons as the skeleton, I can pencil in the details (and erase/move when needed) throughout the week to stay organized. To see more of my layouts, both at the beginning and end of the week, be sure to follow me on Instagram. If you haven't shopped with Erin Condren and would like a coupon for $10 off your first order, click HERE to get signed up! To start shopping my icon stickers on Etsy, click HERE. Use coupon code FREESHIP30 for free shipping on orders over $30! Have a wonderful long weekend and happy planning!